Hotel Ombrosa has parking, air conditioning and WI-FI in public areas. The rooms have a balcony and small pets are allowed. 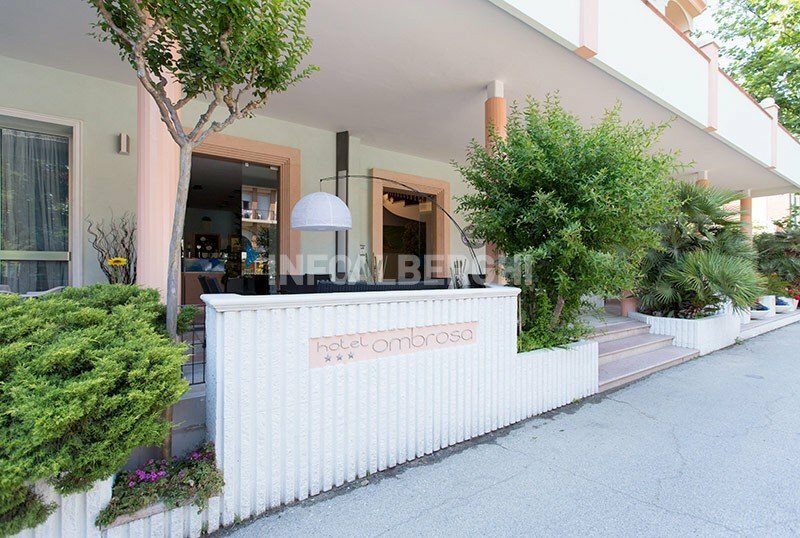 The property is located a few meters from the beach, accessible from the road of the hotel, without having to cross busy streets, and is also close to the center of Bellaria. The rooms are comfortable, with a balcony overlooking the sea, satellite TV and digital terrestrial, WI-FI, telephone, and private bathroom with shower and hairdryer. Garden, terrace, bike rental, TV room, reading room, internet point. Shuttle service to airport and station. CONVENTIONS: with beach and amusement parks. BREAKFAST: served buffet style with homemade cakes. LUNCH AND DINNER: two menus to choose every day, vegetable buffet. Pasta and desserts are homemade. The hotel has an agreement with the Bagno 25 Gigi with spaces and services dedicated to adults and children. Prices are per person per day full board for a minimum of 3 days. Very special for the June 2 Bridge! - 3 days full board (breakfast, lunch and dinner) for € 149 per person. - 3 days in All Inclusive (breakfast, lunch, dinner, drinks with meals and a parasol and 2 sunbeds) at € 179 per person. - children up to 4 years free and up to 10 years 50% discount. "Weekend when you want ..."
Let yourself be carried away by the events of the "Pink Night" on New Year's Day.